A 26-year-old filmmaker has accused TVF founder Arunabh Kumar of inappropriate behaviour while on set. Sengupta goes on to say that she told her producer how she was creeped out with this behaviour. Her producer then made sure that she wasn’t alone with Kumar for the rest of the shoot. 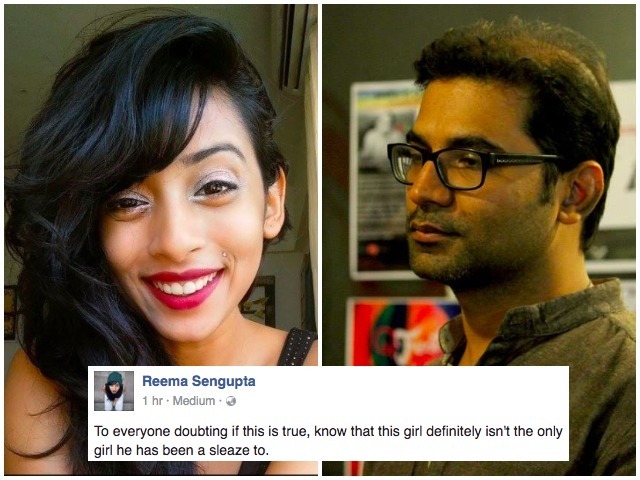 Update: Another woman has come out about her experience with Arunabh Kumar. Reshma Patra says that in 2012 she’d messaged Kumar for a coffee because she was new in the city and she’d been batchmates with him at IIT Kharagpur. During the conversation, Kumar had reportedly asked her, “Would you go to my place, and dance for me?”. “He said he’d like to see me get naked and see me stripping and dancing *for him*,” she alleges. The count is reaching double numbers soon. Yet another woman has spoken up about an uncomfortable experience with Arunabh Kumar. Rafiya Khan, a former Assistant Producer at independent agencies, says that she became acquainted with Kumar when she was moving into a rented studio that TVF was moving out of. One day, she says that Kumar called out to her. “Out of now where he started telling me he just came back from some place in Ratnagiri, and he bought mangoes. He asked me if I liked mangoes, while his mouth spoke those words, his hands slided on my back, from neck to waist. Im not someone who gets scared easily, I wasnt scared, I just knew his intentions. I moved away from him, stared and said a NO and walked off. Since that day he never met his eyes with me. I should have punched him, but I ignored,” she says in a Facebook post. Last night, a blogpost had gone viral detailing how Arunabh Kumar had repeatedly harassed a girl from his hometown of Muzzafarpur while she was working with the company. The blogpost had contained serious allegations, but none of these could be verified because the author chose to remain anonymous. TVF, for its part, has vehemently denied the claims. “The article is completely ludicrous and defamatory against TVF and its team. All the allegations made against TVF and its team in the article are categorically false, baseless and unverified,” it had said in an official statement. Amit Golani, a senior member of the TVF team, has also said that “no such person” from Muzzafarpur worked at TVF. Utter nonsense and false claims on an 'Anonymous' post. There has been no such person existing from muzaffarpur working at TVF. There have been several other accounts of women reportedly coming forward with their experiences, but we haven’t been able to independently verify them. We’ll update this article as the situation develops.